Software giant Microsoft Corporation (MSFT) is a component of the Dow Jones Industrial Average that is one of the best performing stocks so far in 2018. Microsoft is up 22.9% year to date, while the Dow 30 is up just 1.9%. The stock set its all-time intraday high of $106.50 on July 17, testing this week’s risky level of $106.30. Microsoft stock is in bull market territory at 25.4% above is 2018 low of $83.83 set on Feb. 9. Microsoft has been above a “golden cross” since Aug. 15, 2016, when the stock closed at $58.12, which justified adding to a core long position for the stock. A “golden cross” occurs when the 50-day simple moving average rises above the 200-day moving average, indicating that higher prices lie ahead. The stock has been above its 50-day simple moving average since July 2. The three horizontal lines at the top of the graph form a zone of risky levels – my monthly, quarterly and weekly pivots are $103.34, $105.06 and $106.30, respectively. My semiannual and annual value levels are $94.10 and $70.22, respectively. 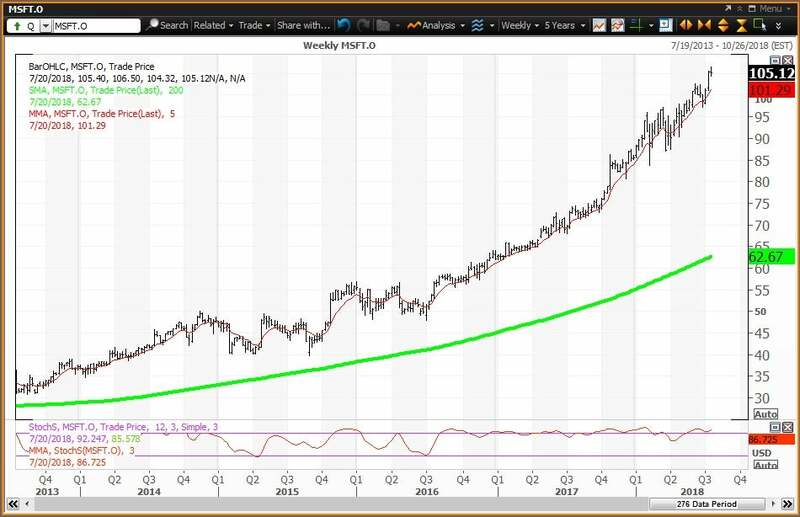 The weekly chart for Microsoft is positive but overbought, with the stock above its five-week modified moving average of $101.29. The 200-week simple moving average, or the “reversion to the mean,” is at $62.67. The 12 x 3 x 3 weekly slow stochastic reading is projected to end this week at 86.73, up from 83.96 on July 13 – both readings are well above the overbought threshold of 80.00.